Growing up, my parents always ate quite traditionally. There were roasts every Sunday, plenty of casseroles to be had, seasonal puddings to be snaffled and, of course, liver and onions. As you’re probably aware, most children won’t go within touching distance of offal. The same was true in my mother’s kitchen. That attitude could never last for long, however; liver is too scrumptious not to be appreciated. 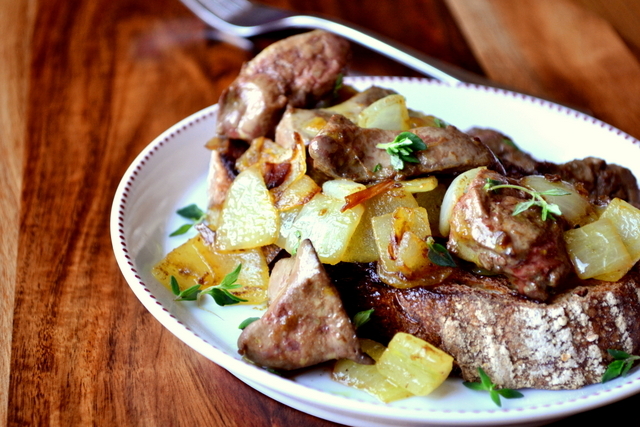 This recipe for Duck Liver and Onions is fast becoming a favourite. Once you get past the fact that offal is what it is, you really start appreciating it. Liver, in particular, is easy to come by, frugal in the extreme, wonderfully flavoursome and has a really appealing texture; an almost soft-as-butter feel. Of course, as with any meat it has to be cooked to perfection. Don’t worry about a bit of pink; that’s how things should be. That’s how you know it’s tender. 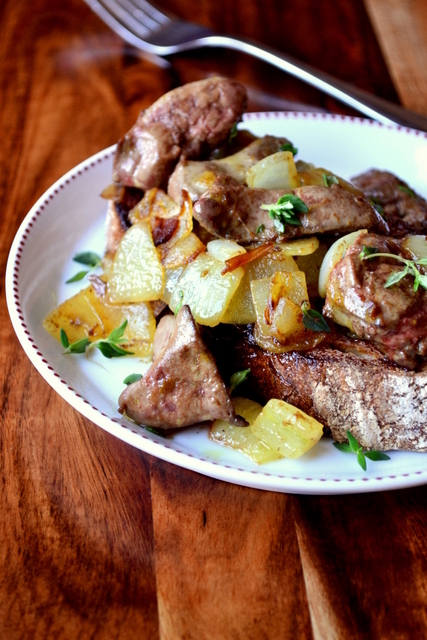 Cooking liver and onions takes so little time that it’s the perfect easy weekend lunch. No matter what revelry has taken place the night before. 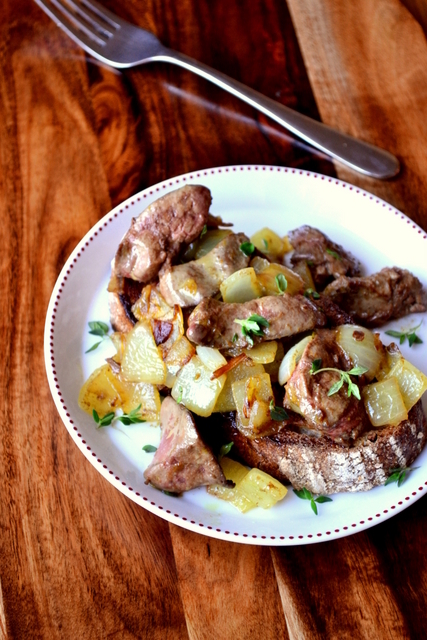 Even if you’re basically crawling from your pit of slumber, you’ll be enjoying a hearty slice of sourdough toast topped with succulent duck liver and sweet onions in no time, topped with that all important sprig of fresh thyme. Heat the olive oil and begin to sauté the onion over a medium heat. Wash your livers and chop each into 4 large pieces. Add the mustard and vinegar to the onions and stir until incorporated, season with a pinch of salt. Pop your bread on to toast. Add the chunks of liver to the pan and brown on each side, cooking for 3-4 minutes. Be careful not to overcook, they should have a tinge of pink on the inside. 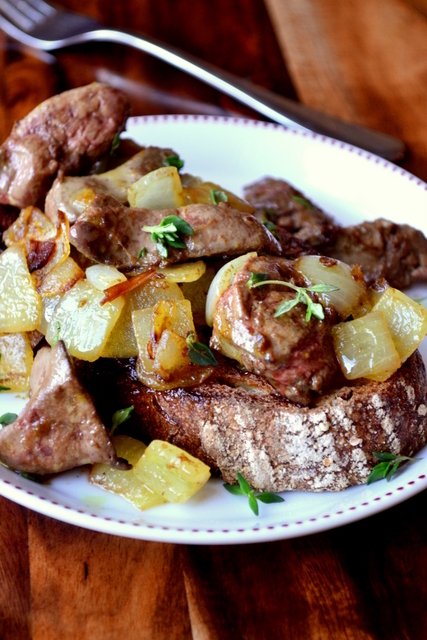 Spoon the liver and onions onto the toast and serve with a sprig of fresh thyme. As such, this lazy weekend lunch for two should set you back no more than around £1.60. My pleasure. You have a supplier? Fancy. This reminds me of my childhood! Once a week my mom served liver and onions!! Lucky you – though I hated liver as a kid. I grew up with calves’ liver and onions, and hated it. The eye-burning misery of slicing and caramelizing half a dozen onions. The shoe leather texture of overcooked broiled liver. It was my least favorite meal my mother ever made, and she made it about once a month. Now, my grandmother’s Passover chopped liver, on the other hand, was divine. At least it was only once a month! At least you do actually like it if cooked properly. Thank you! Do you have a local butcher near by? Well, in my case in semi-rural Australia, chicken livers will just have to do 🙂 ! This is a most unctuous recipe to be enjoyed occasionally, but you have forgotten some apple to go alongside the onion and the cognac ‘flame’ 😀 !! Superb photography!!!! Chicken livers are also yum. I’d have used cognac, but we’re trying to be frugal here. Also, I don’t have any at the mo! [Laughter] Sorry, forgot about the ‘frugal’ bit 🙂 ! But have loved chicken livers, onion and apple cooked together since my early marital days – if you have any idea who Vincent Price is: from his tome of a marvellous cookbook – he was a better chef than actor 😀 !! May I swear?? Your recipe so brought the Vincent and Mary Price book to mind, I went ‘shopping’! Darn it at times living Down Under!! Oh, I could get a first or second print copy for under $US40, but the postage would be over $US70!!!!!!!!! Trust husband #1 demanding he keep it!!!!!!!!!!! Look, what you have done!!! [laughter !!] Have just bought a wonderful copy Ishould have so many years!!] Thank you 🙂 ! And, please, do NOT ask about the postage, but I HAVE IT!!!!!! Glad I inspired you to buy it 😀 – I’ll have to look it out! Love calves liver, onions and streaky bacon. A treat that brings one back to childhood. I think we’re going to pick up some calves liver soon. Tempted to fry it or batter it or some such. I love liver and onions. I had a similar dish in Strasbourg but it was served on top of rocket. Ooooh yummy – I love rocket.